Chief Minister Prem Kumar Dhumal announced opening of Sub Tehsil at Nithar in Ani assembly segment of district Kullu to provide villagers of the area revenue and administrative related services at their door steps. 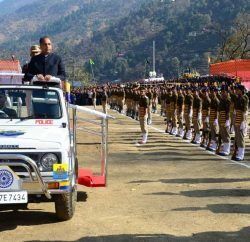 He was addressing a gathering at Ani Sub Divisional headquarters of Kullu district after dedicating Government Degree College complex in Haripur completed at a cost of Rs.10.50 crore to the students, Police Station building and Sub Divisional Police Officer residence completed at a cost of Rs. 80.15 lakh and Rs. 48 lakh respectively. Chief Minister said that with opening of Sub Tehsil a long pending demand of villagers of Nithar area has been fulfilled. He also announced Rs. 25 lakh for construction of play ground of Degree College Haripur and Rs. 8 lakh for purchase of furniture to the college and assured that Science and Commerce classes’ would also be started in the college in a phased manner to provide higher educational facilities to the students in rural areas. He said that State Government was spending highest 19 percent of its budgetary provision over the education while Government of India was spending only4.85 percent over the same although Government since independence had been mulling proposal to earmark 6 percent of the budget over education sector. He expressed happiness over the increasing number of girls in colleges as had been the case in Degree College Ani where out of total strength of 411students 271 were girls. 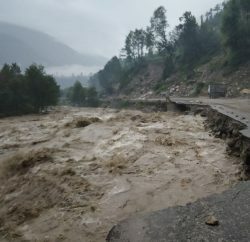 Prof. Dhumal said that the State Government was committed to construct tunnel under Jalori pass to connect Ani Sub Division with district headquarter of Kullu throughout the year. He said that Rs. 25 lakh had been provided for preparation of Detailed Project Report to ascertain feasibility of tunneling project. He said that State Government had succeeded in getting Sainj-Luhri- Ani-Aut declared as National Highway where improvement of road would be taking place in the near future. He said that Ani assembly segment had been accorded top priority with regard to road connectivity and it had been among the top ten constituencies in the State which had been sanctioned maximum amount for construction of roads during BJP regime. He detailed the achievements made in the district during last four and a half years and said that during BJP regime1025 new cases of social security pension had been sanctioned in the district thereby increasing the number of such cases to 19752which also included 6778 in Ani segment. He assured the local milk producers that all their dues would be cleared by 15th August, 2012. 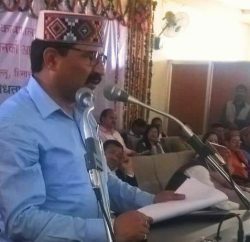 Khimi Ram, Forest Minister detailed out the developmental activities which had taken place under the leadership of Prof. Prem Kumar Dhumal, Chief Minister. He said that it was due to spectacular development in the State that it had won 67 national and international awards during last four and a half years. Kishori Lal, local MLA welcomed the Chief Minister and thanked fordedicating architectural monument building to the students and sanctioning 36road projects in the segment. He also thanked the Chief Minister for providing veterinary dispensary in every gram panchayat and urged him for expediting the work on proposed tunnel project under Jalori pass. He also apprised the Chief Minister about various demands of the area. Ms. Anu Thakur, Chairperson, Panchayat Samiti also welcomed the Chief Minister. Hira Lal, MLA, Karsog, Kushal Chauhan,, President, BJP Mandal Ani, Meena Sharma, Member State BJP Executive Committee, Ram Singh, President, District Kullu BJP, YogeshVerma, Secretary, State BJP, I.D. Bhandari, DGP, Dr. Dinkar Burathoki, Director, Higher Education, Amitabh Awashti, Deputy Commissioner, Ashok Kumar, S.P, other senior officers and prominent people of the area were present on the occasion among others.